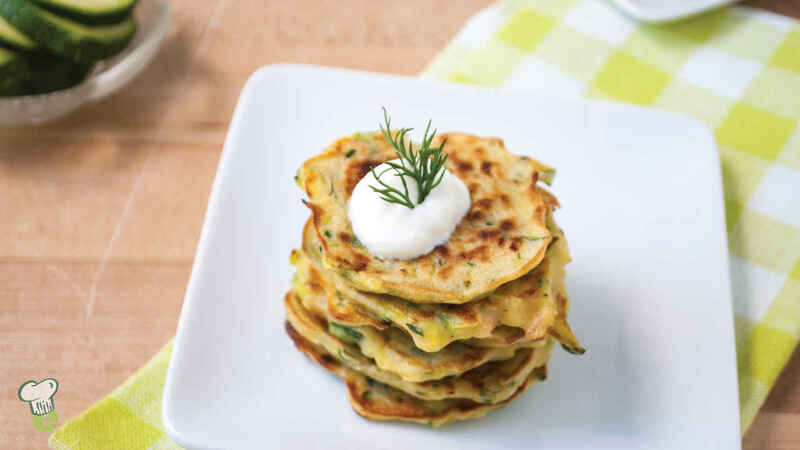 Healthy zucchini replaces potatoes in these flavorful latkes with smoked salmon. Make them for the holidays, or pair them with a tossed salad for a heart-healthy brunch or light lunch. In a large bowl, combine eggs, olive oil and milk, and stir until blended. Add flour and whisk until smooth. Stir in smoked salmon, zucchini, dill and pepper (to taste). Coat a large skillet or griddle with nonstick cooking spray and heat over medium heat. Pour batter by rounded tablespoonfuls onto skillet and cook 2 to 3 minutes, or until bubbles appear on top. With a spatula, flip pancakes and cook another 2 to 3 minutes, or until lightly browned. Remove from skillet and keep warm. Repeat with remaining batter, coating skillet with nonstick cooking spray between each batch. Serve warm garnished with a dollop of sour cream and dill sprig.